1 of 1 Whisk together 1/2 cup smooth peanut butter, 1/2 cup hot water, 3 tbsp reduced-sodium soy sauce, juice of 1 lime and 2 cloves chopped garlic. 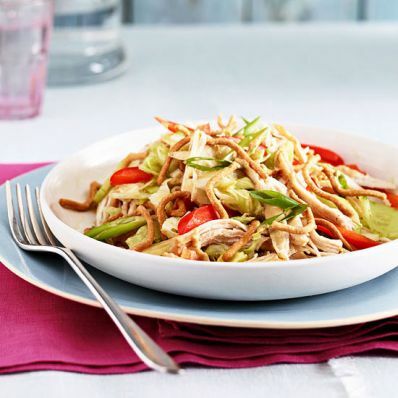 Evenly distribute 1 head shredded iceberg lettuce, 2 cups cooked shredded chicken, 1 sliced peeled cucumber and 1/2 sliced red pepper among 4 plates. Top each serving with some of the peanut dressing, sliced scallions and crispy Asian noodles, if desired. Serve remaining dressing on the side. Per Serving: 25 g Fat, total, 482 kcal cal.